We stood on the edge of a chunky, red dirt road. Really, it was more like a wide trail, moving along the Indian Ocean shoreline. The sand grass fought to overtake the track and obscure any hints of humanity. Facing the ocean, we could easily imagine this remote locale had been untouched by history. But not so. We turned around and faced a black fence protecting a carefully manicured cemetery that held the remains of soldiers, African and foreign, who fought on this soil in World War I. We forget the story of humanity leaves markers all around us. Discovering those secrets, known only to a few and learned only by those who care to listen, excites me. 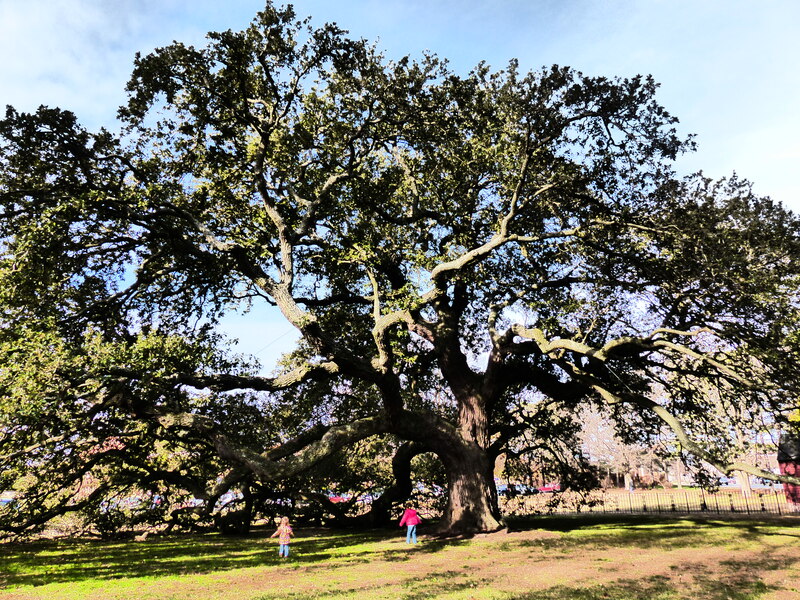 We recently had that experience regarding a tree in Hampton, Virginia. A tree. I’m pretty excited about this tree. It was illegal to educate blacks in the South, slave or free. But in 1861 Mary Peake taught her first class of students under this tree’s branches. 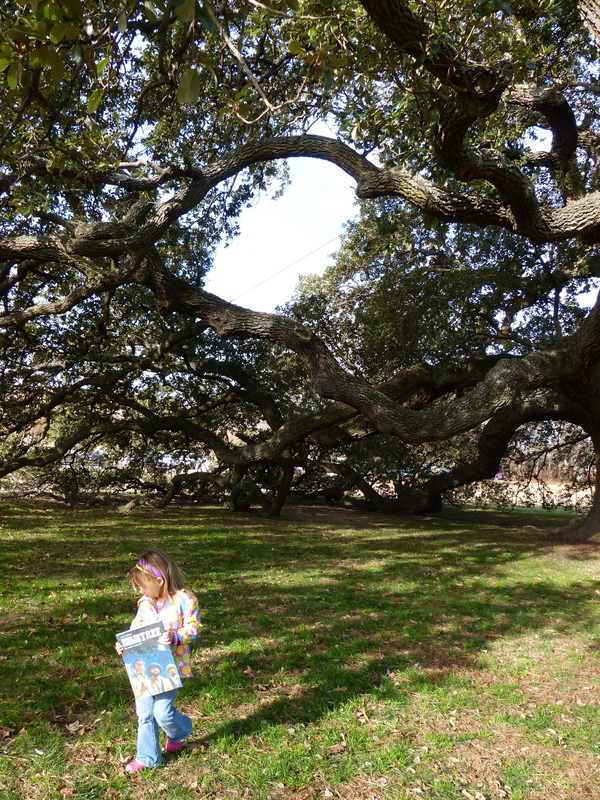 In 1863, in the shade of this aged oak, the first Southern reading of the Emancipation Proclamation took place. Slaves in Confederate-held territory were declared free. According to the oft-quoted Hampton University website, the tree is designated by the National Geographic Society as one of the Ten Great Trees of the World (though I could not find a substantiating citation on the National Geographic website). From a distance or to the quick passerby, this massive oak can easily be misconstrued for a small grove of multiple trees. Its lower limbs, each the size of a tree trunk, rest on the ground, weighed down by time. The tree spends its days watching cars enter the highway on the entrance ramp several yards away to the east, and guarding the parking lot to the west that serves Hampton University. One placard, unnoticeable to the unlooking eye, stands against the low, wrought iron fence that protects one half of the tree. You would never know the story of this tree unless someone told you. 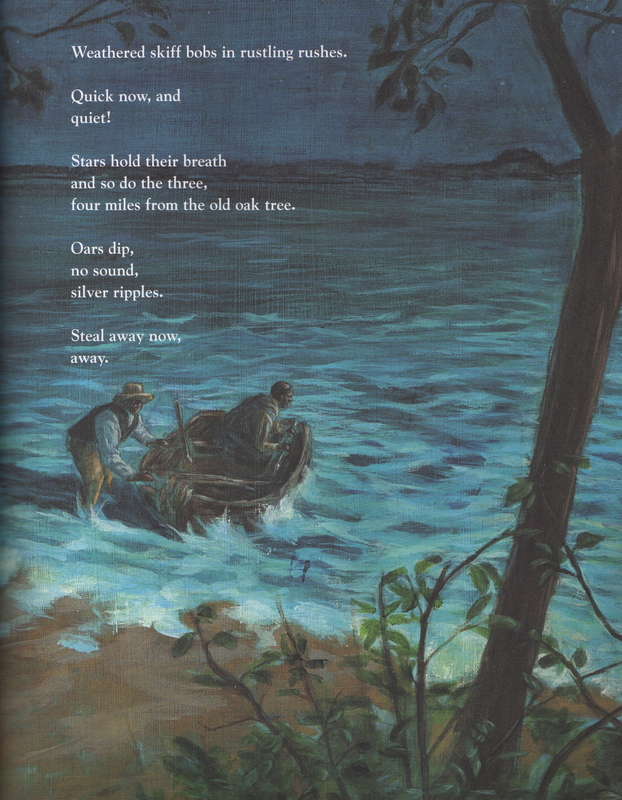 We know the story because we happened upon it through a remarkable bit of children’s literature. Written by Susan VanHecke and published just last year (2014), Under the Freedom Tree recounts in poetic narrative the history of not only the Emancipation Oak, but escaped slaves who became ‘contraband of war’ during the Civil War and established the first black, self-contained community in America within earshot of the then-young oak. From their escape across the wide channel at Sewell’s Point*, Norfolk, to Ft. Monroe in Hampton, the story highlights three brave men who paved the way for other blacks to find an enclave of freedom in the South during the Civil War. Just as one can stand facing the waters on the coast of East Africa and not discern the events of history memorialized in the soil an eye glance away, so we often discount the story of our place – where we live, move and dwell. Knowing the story brings understanding and significance to why, and how, things are the way they are today. Engaging literature such as Under the Freedom Tree exposes our children to those realities at an early age. In the United States we celebrate Martin Luther King Jr. Day on the third Monday of January. Perhaps a fitting way to honor the day would be to educate yourself (and your kids!) by visiting the oak that stands as a living monument to freedom. There are no signs guiding visitors to the oak, but it is visible from the eastbound access ramp 267 onto Interstate 64 in Hampton, Virginia. 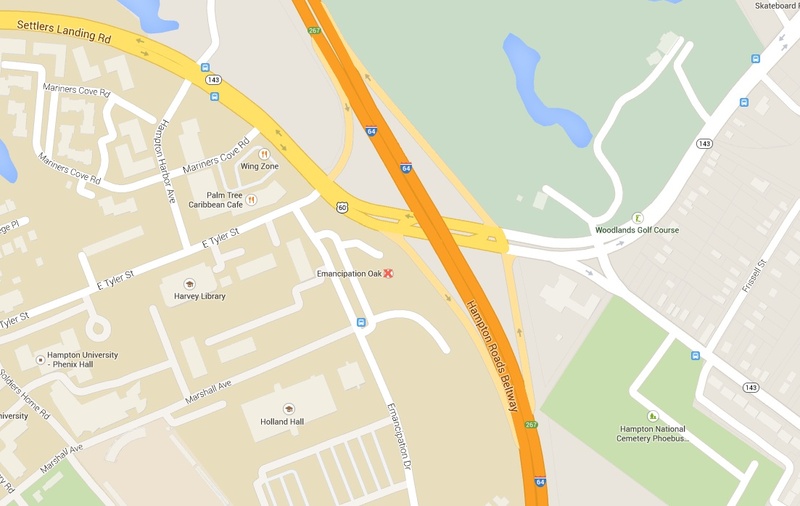 For a close-up viewing, it can be accessed from Emancipation Drive (see map below). * According to VanHecke, the location where the three escaped slaves boarded a boat and rowed across the river is at the fishing pier on the Norfolk Navy Base. This location is not open to the public, but military members who have access can visit the unmarked spot (see map below with the red ‘x’ for exact location). 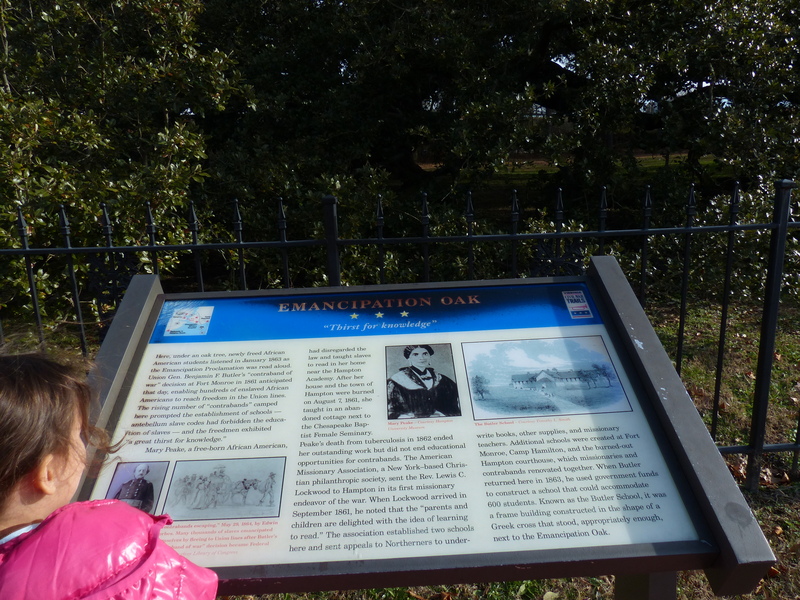 For more on the Emancipation Oak, visit Hampton University’s website. Read about the WWI cemetery in East Africa here.